The version 1.2.4 of CRYOLIB toolkit has been released today and is available for users. The new version includes major enhacements in fluid properties calculation, which improves the computational time with respect to the previous version. Additionally, new components has been included in the package and new features were introduced in the existing components. This new version adds support for new 64 bits compilers. The 41st Annual Meeting of the Spanish Nuclear Society was held on September 23, 2015 in A Coruña, Spain. The meeting brought together leading companies, research centers and universities in the area of nuclear energy. A Test Blanket System model developed in Excel and based on a set of EcosimPro simulation libraries (TRITIUM Toolkit) was presented during this event. During the presentation it was explained why the availability of simulation models is very important, as they are fundamental tools for determining the amount of tritium present in the ITER project. Empresarios Agrupados was asked to find the root cause of a loss of efficiency in the secondary circuit (Rankine steam cycle) of a power plant. It was suspected that the duplex heaters of two of the three condensate trains were responsible for the loss of efficiency. Still, although it was fairly certain which equipment were causing the problem, the problem itself was far from solved, because it was necessary to determine the exact failure in order to facilitate inspection of the equipment during refuelling. A plant energy balance model was developed using EcosimPro and THERMAL BALANCE library to simulate various scenarios with a high degree of approximation to the response of the cycle, both in rated operating conditions and in degraded operating conditions caused by wear or equipment malfunction. Different equipment degradations and failures were postulated, applying an optimisation algorithm to each degradation or failure. This allowed changing the level of supposed degradation to minimize the difference between the values measured in plant and those calculated. Logically, the most likely cause of the problem would be the one that most reduces the deviation between the measured values and those calculated by the energy balance, after applying the optimisation algorithm. This fairly simple technique allowed identifying the cause of the failure. 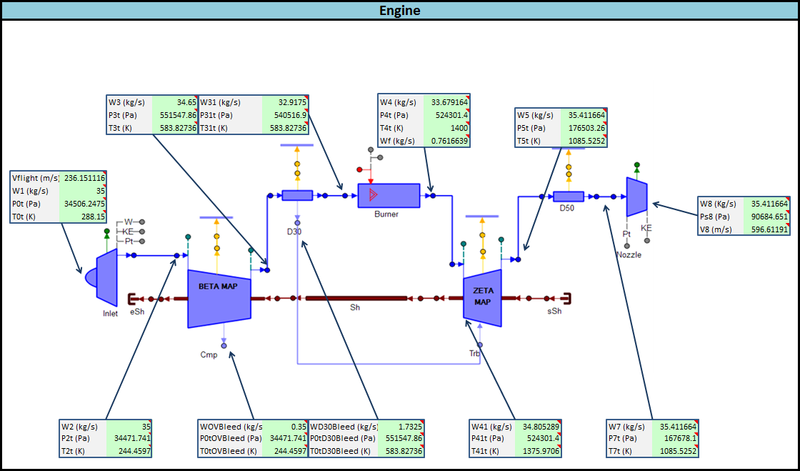 During the plant’s refuelling outage, the equipment located in the zones identified by the simulation model was inspected and the exact type of failure that had been predicted by the model was found. The plant energy balance simulation model developed in EcosimPro was linked to and run on an Excel spreadsheet to make post-processing of the results of the different scenarios easier, as shown in the following figure. To perform the analysis, a detailed model of the condensate trains had to be developed. The following figure shows the results of the energy balance of the trains supposing an operating failure in them. It is important to point out that the set of possible errors is not only decided by the model but basically by an expert deciding on the basis of his experience and physical perception. A sophisticated calculation model is a valuable tool but not if used improperly or if its results are poorly interpreted. In this respect, the heat balance of the plant developed in EcosimPro enabled locating precisely the operating problem/failure in the condensate trains that was affecting the output of the power plant. This study demonstrates the flexibility and usefulness of EcosimPro for evaluating efficiency and power losses in power plants. Users of modelling and simulation tools often need to perform a large number of simulations on a single model. The purpose of this process is to evaluate the different results so as to establish the optimum solution (trial-and-error technique). Having an intuitive GUI is indispensable to facilitate the configuration, run the simulations and obtain the results. In this type of situation, the direct connection between PROOSIS and Excel can be handy for the user. This capability simplifies and expedites the required simulations, in a known environment that most engineers are familiar with. Furthermore, it allows users that are not very knowledgeable of PROOSIS to perform all sorts of simulations, since this interface hides the complexity associated to the experiments generated in EL language. The creation of flexible experiments with adaptations so they can be handled from Excel yields extremely comprehensive simulation tools. The connection with the Microsoft software allows users to customise the graphical interface so as to facilitate the interaction with the PROOSIS-generated models. In our case, the simplicity and flexibility of Excel has allowed its use as graphical interface for the design of a tool for the simulation of the design and actuations of turbojets and turbofans, submitted as a qualification project for the Escuela de Ingenieros Aeronáuticos de Madrid (ETSIA). The correct adaptation of an experiment in EL language in PROOSIS and the graphical customisation of an Excel book were enough to obtain the end product. With this new tool, users can complete a wide range of calculations with the Excel toolbar, without any need for knowledge of PROOSIS or EL language. In addition, all the calculations allow different configurations for the inputs to be selected, so that end users enjoy a great degree of flexibility in their simulations. Finally, simulations present results in a clear format, arranged intuitively in several calculation sheets. The values obtained for the system performances are represented both graphically and numerically, depending on the requirements of the calculation. The new PROOSIS (v3.6.14) goes even further in the connection of the models to Excel. This version allows self-contained decks to be exported together with their Excel interface. In this way, they may be distributed among users without PROOSIS. 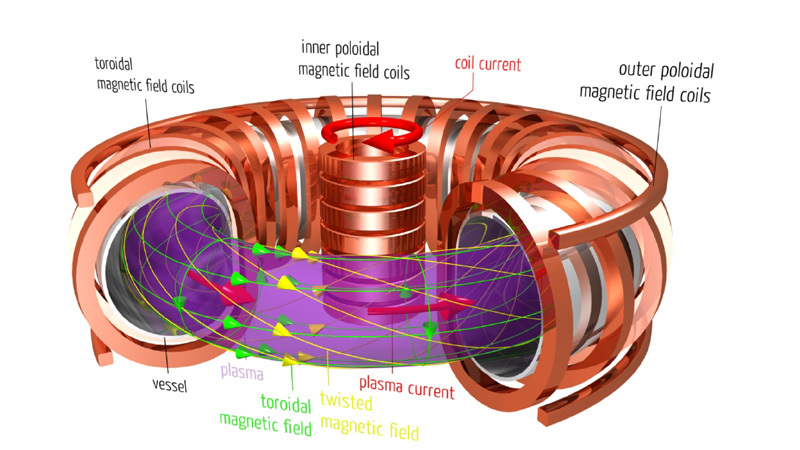 The modelling phase of the cooling circuits of the ITER magnets responsible for confining the plasma in the Tokamak has concluded. The magnets are the main users of the ITER cryogenic system; for this reason, and to ensure correct operation of the system, it is essential to have models that are capable of reproducing the dynamic behaviour of the system in different scenarios. The simulation of the circuits that cool the magnets allows analysis of the load that this cooling represents for the plant, and provides a guarantee that the cables-in-conduit that comprise the coils are maintained below the critical temperature that if exceeded would lead to the loss of the super-conductive properties and cause the reactor to shut down. The models developed with CRYOLIB library have also allowed us to analyze other scenarios, like the cooling of the magnets from an ambient temperature of 80 K. In this case, it is critical for the selected cooling strategy to guarantee a total system cooling time of less than 500 hours, while at the same time guaranteeing that there is no in-system temperature difference of more than 50 K, to prevent thermal stress in the structure. Another scenario analyzed was the re-cooling of the magnets after a quench. In the event of a quench there is an increase in temperature and pressure in the magnet cooling system that forces the disconnection of the cooling via the auxiliary cold box, and the release of a certain quantity of coolant into the quench tanks to reduce the pressure in the circuits. The magnets then have to be immediately re-cooled directly from the cold box of the helium cooler before being reconnected to the supercritical helium circuit. The optimization of the time required to re-cool the system so it can become operational again is another especially important aspect. The next step would be to model the remaining sub-systems with a view to obtaining a plant simulator that would provide the engineers with a tool for the design and optimization of plant control during the design and commissioning stage, and which could also be used for training operators. For this it is necessary to implement the models of the helium and nitrogen coolers, the lines that take the helium from the plants to the users and to other users such as the cryo-pumps, including the complex control systems that regulate the operation of the different users and the coolers. Given the complexity and size of the ITER plant, the integration of all the sub-systems into one model represents a challenge, due to the computational load on the simulation tools. It also means having to optimize the tool in order to be able to make the best use of the computer resources and maybe the need of using distributed simulation techniques to improve the simulation time of the model. The complete model of the cryo-plant will allow optimization of the work in parallel of the coolers so that this will be more efficient. It will also provide a global view of the plant. Moreover, the future simulator can be put to other uses after the design phase, such as operator and engineer training for normal plant operation and failure situations. Latest newsletter from the EcosimPro/PROOSIS working group is now available in English and Spanish. It contains information about new versions of our products, including EcosimPro, PROOSIS , FLUIDAPRO Toolkit, ECS Toolkit, and ORC Toolkit. Moreover, information of past conferences and forthcoming courses is provided. Finally, several modelling and simulation cases are presented. The course “Space Propulsion System Modelling with EcosimPro/PROOSIS” will be held in our Madrid offices on 6th, 7th and 8th October. This course is aimed at engineers working on the design of space propulsion systems. The course will start with an introduction to the use of EcosimPro that will help students become familiar with the graphic user interface and with the basic use of the programming language. The next step is the graphical creation of new models related to space propulsion, as well as the configuration of associated experiments that allow their simulation and the display of the results. Once the basic concepts have been grasped, the second part of the course will focus on the modelling of space propulsion systems and subsystems. Students will learn about the main features of the ESPSS space propulsion libraries and will complete test models to check the simulation capabilities for fluid transient effects (water hammer), heat transfer, combustion processes, turbo-machinery or tanks, among others. The last part of the course will focus on the creation, simulation and analysis of complete typical space propulsion models. Systems such as the filling of a complex pipe network with homogenous two-phase flow, a fuel tank pressurisation system with associated control or the configuration for startup, stabilisation and shutdown of a rocket engine, including the corresponding valve opening laws, will be studied. The simulation capabilities of steady-state models of these systems under design and off-design conditions will also be displayed. Finally, the different possibilities of connection to external software will also be explained. The course on “Modelling Gas Turbines Engines with PROOSIS” will be held on 22nd, 23rd and 24th September in our Madrid offices. This course is aimed at engineers involved in the design, modelling and calculation of performance for aeronautical gas turbines. The course includes an introduction to the modelling with PROOSIS and its TURBO toolkit. The components required to model aeronautical motors will be described, and practical exercises on typical systems such as turbojets, turbofans, turboshafts or turboprops will be done. In addition, a wide range of studies will be explained and completed, including the design, off-design, transients, optimisation studies, parametric studies and sensitivity studies. Finally, there will be an explanation about how to export the complete models, such as black boxes and the different possibilities for connection with other environments. 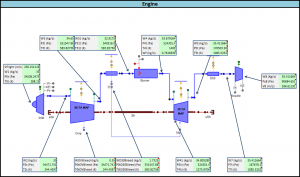 Engineers attending the course shall find that PROOSIS is a powerful simulation tool. Its unique features provide a complete environment to simulate both the different types of aeronautical engines and their associated systems: Control System, Electrical System, Environmental Control System, Fuel System, etc. A new version (4.0) of the TURBO toolkit is now available in order to improve the accuracy of transient calculations and further facilitate multi-disciplinary calculations within PROOSIS. In addition, a number of minor modifications have also been implemented to correct errors and improve component modelling and handling.